This issue contains an interview with Kate Pickett and Richard Wilkinson, authors of the Inner Level. In the face of increasing numbers of people who are living and dying on the streets, this issue of Asylum calls for safe havens and a new, more holistic approach to mental health care. In this issue, we also consider how the underlying politics of Mad Pride can be seen to be consistent with demands for prescription abolition; the impact of the Hearing Voices Movement on one professional’s practice, and we publish a reflection, by a veteran survivor activist, on activism in the 80s. We include too pieces with a focus on distress and anxiety. This issue turns the spotlight on women’s mental health, the summit on global mental health, mental health activism and research in Poland and a strike of mental health workers in France. Asylum 25.4 includes our usual news section along with a selection of creative writing. 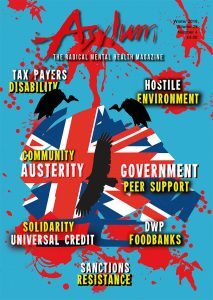 We have changed the strapline of Asylum to ‘the radical mental health magazine. We used to be called the magazine for democratic psychiatry because we were inspired by the Italian movement to close down large mental hospitals and develop more democratic mental health services. We are still proud of our roots but we want to extend our reach, beyond psychiatry or even ‘democratic’ psychiatry. We are also influenced by the psychiatric survivor and Mad liberation movements and people have told us over the years that they think democratic psychiatry is an oxymoron. We don’t know if we agree, but we do want to keep it an open question. To read more. . . . . .